Given the initial value of for each of Sam’s students, write code to automate the rounding process. For each , round it according to the rules above and print the result on a new line. The first line contains a single integer denoting (the number of students). Each line of the subsequent lines contains a single integer, , denoting student ‘s grade. For each of the grades, print the rounded grade on a new line. Student received a , and the next multiple of from is . Since , the student’s grade is rounded to . Student received a , and the next multiple of from is . 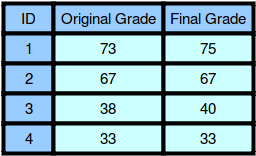 Since , the grade will not be modified and the student’s final grade is . Student received a , and the next multiple of from is . Since , the student’s grade will be rounded to . Student received a grade below , so the grade will not be modified and the student’s final grade is .